Where is the Lie we have lost in living ? Where is the knowledge we have lost in information ? The mood of disillusion and despair characterized by these lines from T.S. Eliot's Choruses from the Rock' may narrate a tale which seems true in the context of the attitude of the modern world to all things spiritual. 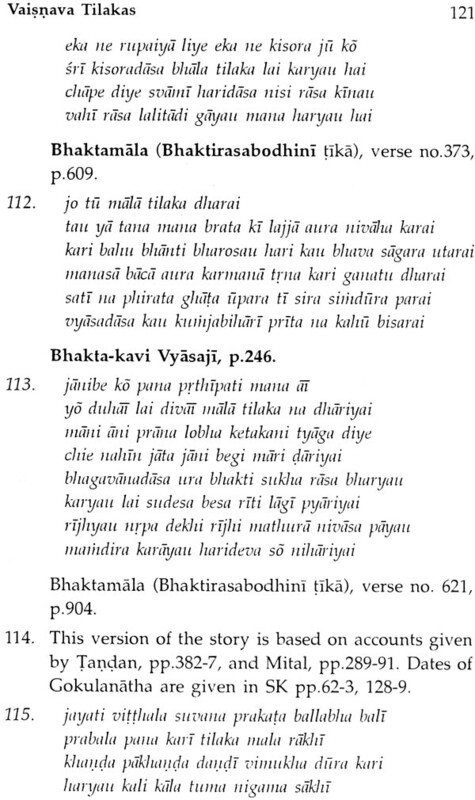 Engrossed in gross materialism, man tends to forget that 'Visible and invisible, two worlds meet in Man;/Visible and 'Visible and invisible must meet in His Temple.' But once you enter the precincts of Vrindavan, you will notice that here is a quiet town, alive and full of excitement, celebrating in numerous ways the memory of the eventful life of Lord Krishna, the incarnation of Lord Vishnu, whose advice to Arjuna on the field of Kurukshetra, contained in the Gita remains the most valuable document in its approach to the struggle that human life symbolizes. 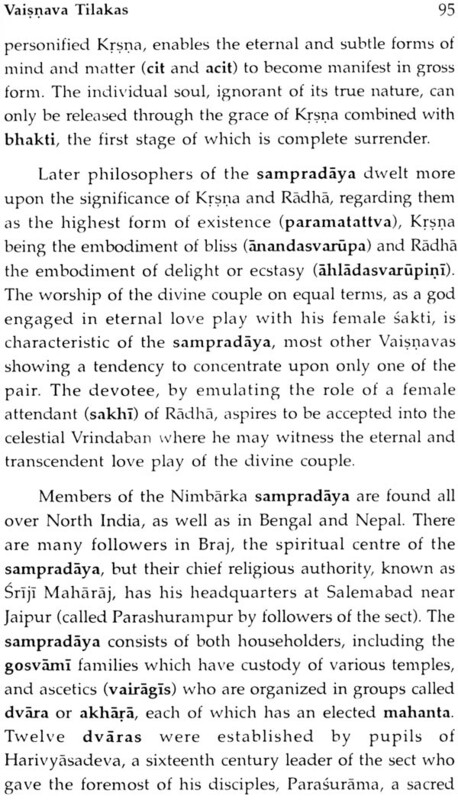 In this town, it is a familiar sight to see devotees and pilgrims from all over the globe, lost in the trance of Krishna's adventures with Radha and the Gopis. 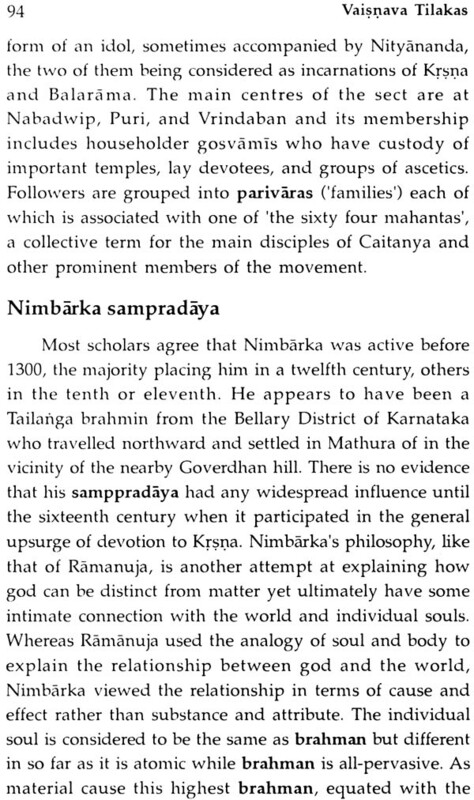 You can identify these enthusiastic believers at first glance from the Tilakas that adorn their forehead. 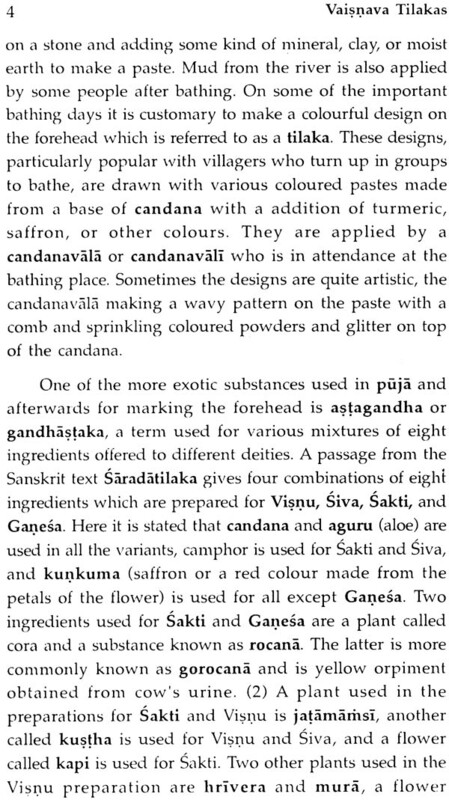 The Tilakas are not mere marks of sandalwood paste used for the purpose of decoration; they are, in fact, symbols of spiritual and cultural tradition handed down as a rich legacy from one generation to the next. 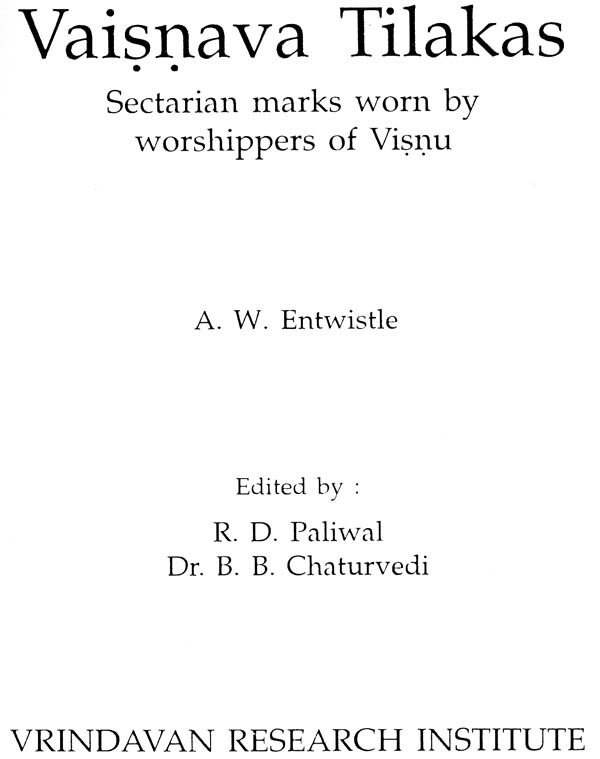 A. W. Entwistle's invaluable document Vaishnava Tilakas: Sactarian Marks Worn By Worshippers of Vishnu is indeed a laudable attempt to lend exquisite charm and grace to this simplistic ritual that conveys a profound message of the veritable link between man's body and his spirit. 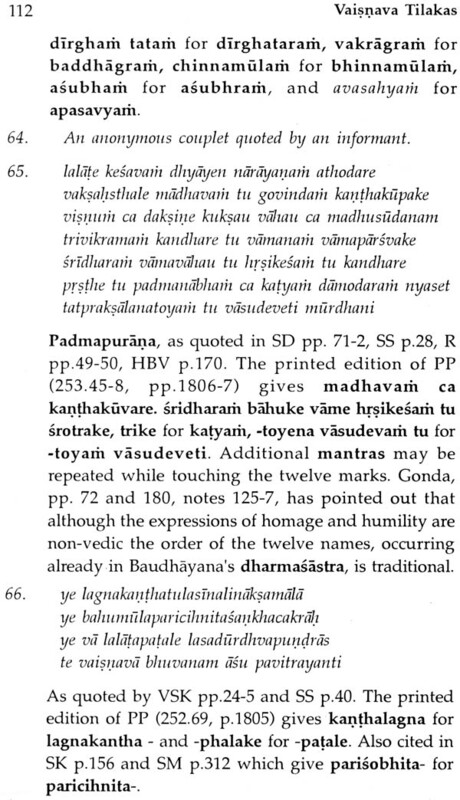 Based on research of the highest order, the book brings to mind a beautiful word-portrait, carved out in minute detail, of the immense variety of this sectarian mark. Scriptural authority mingles with imaginative insight as Entwistle combines observed facts with myths and legends to highlight the various shades and nuances of this religious activity. The enduring popularity of the book, first published in the IAVRI Bulletin no. 11 and 12 in 1981-1982, has necessitated this new edition. 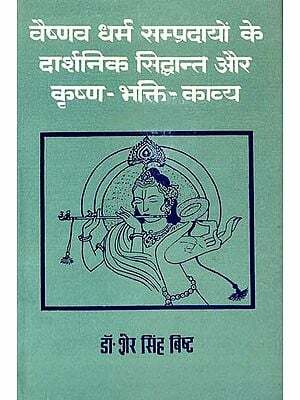 While remaining faithful to the original version, a humble attempt has been made by the Vrindavan Research Institute to render the present edition in a more memorable shape and form. 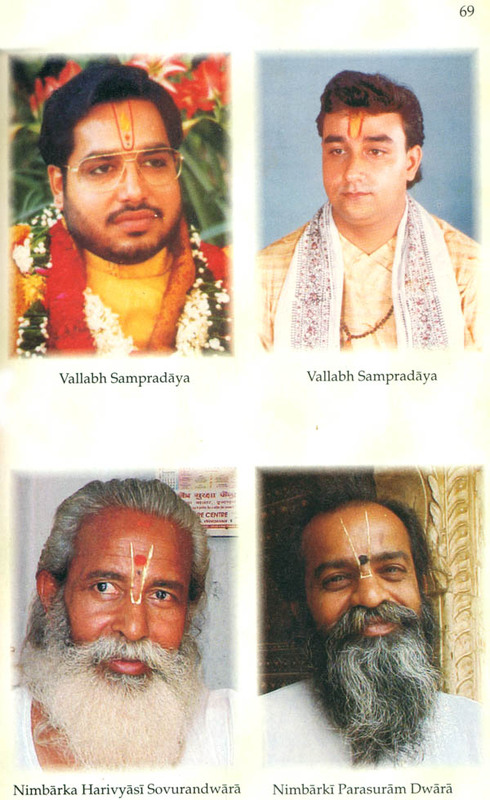 Some photographs of living and practicing saints of the Vaishnava sects have been added to the book as further illustration. 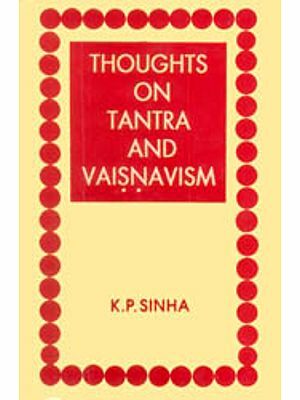 I am optimistic that the attractive presentation, beautified by graphics and colour, will enchant the readers not only to delve deep into the realm of the Vaisnava Tilakas but would also entice them to adorn themselves with these beautiful marks in a spirit of grace and spiritual humility. 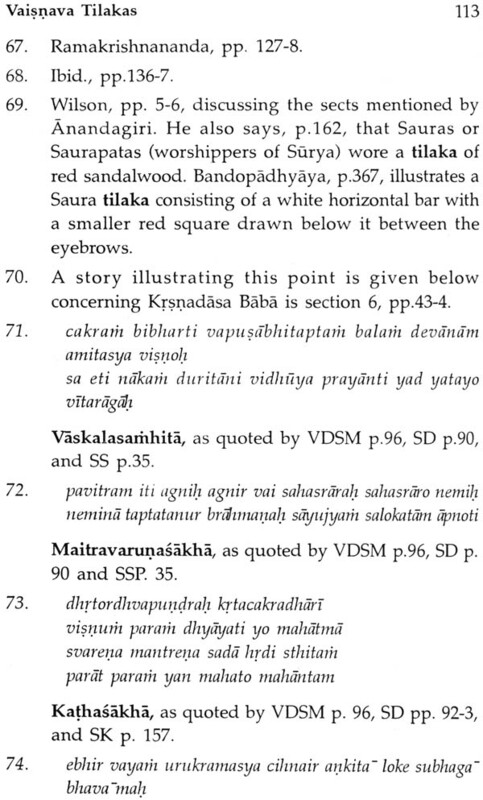 This study of Vaisnava sectarian marks was prepared as a contribution to a research project sponsored by the International Association of the Vrindavan Research Institute, one of the aims of which was to carry out documentation of the cultural and religious activity of the Braj area. 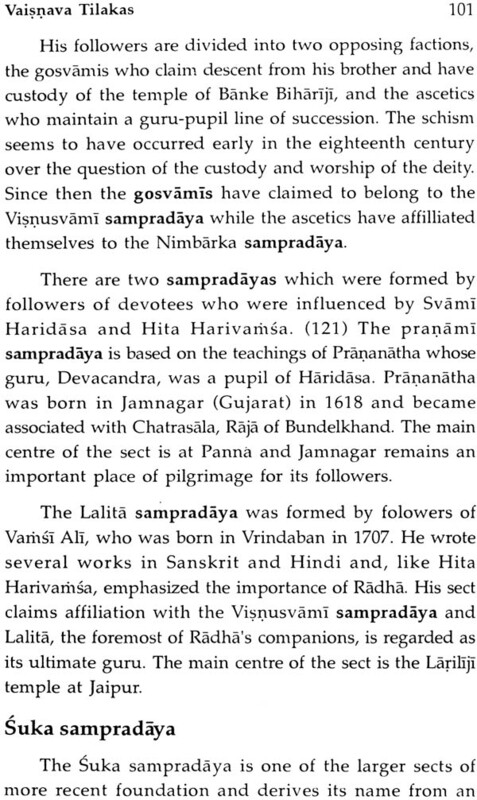 Details available from various texts, works of reference, or studies of specific Vaisnava sects have been incorporated in this study, but the information it contains is based largely on research and observation carried out in Vrindavan over a period of two and a half years (1976-78). 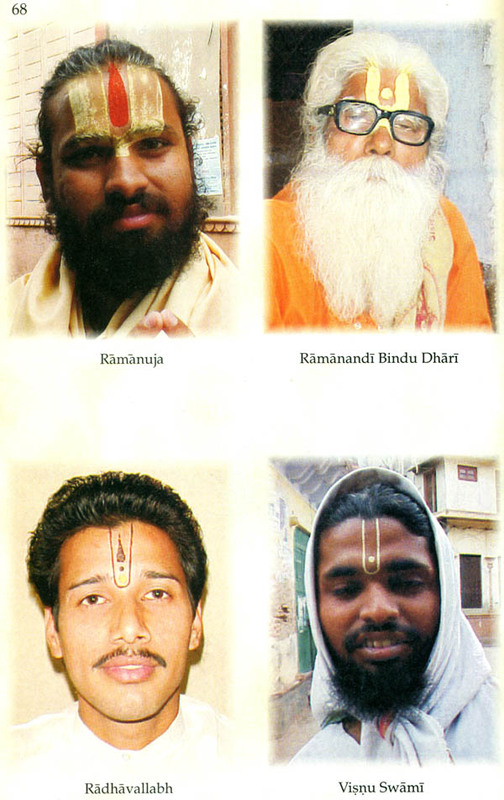 Celebrated as the earthly setting of Krsna's adventures with Radha and the gopis, Vrindavan itself has been a centre of pilgrimage since the sixteenth century, while the nearby ancient town of Mathura and the surrounding area of Braj contain many sites associated with episodes in the childhood and youth of Krsna. Many saints and devotees chose to settle in Braj and, in addition to their literary activity, founded temples and religious communities. 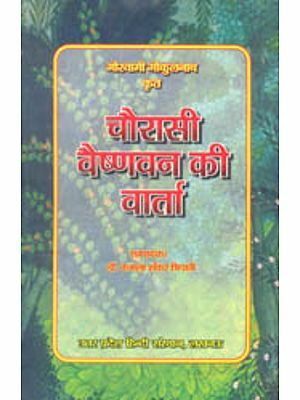 A wide variety of tilakas may be observed in Vrindavan since all the major Vaisnava sects have either their headquarters of important centres in the town itself or in the surrounding area. 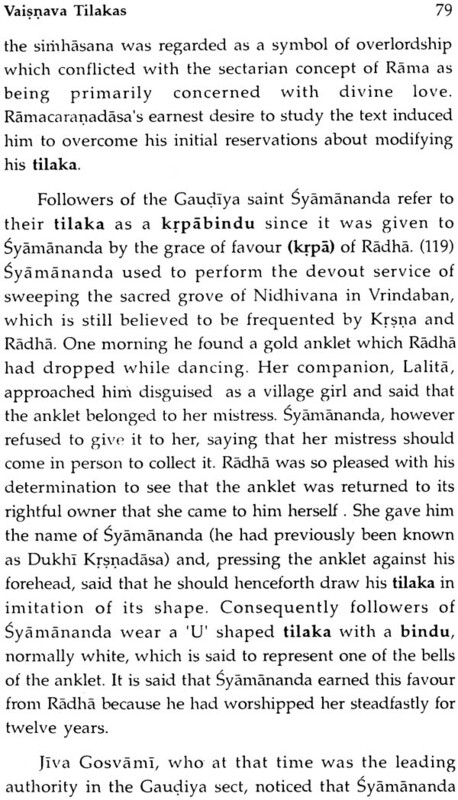 More-over, since religion is the town's raison d'etre and forms the basis of its cultural and commercial activity, the style of dress preferred is relatively conservative and tilakas are commonly worn by devotees who visit on pilgrimage or settle down to lead a pious life and by the local priests and guides who cater for them. 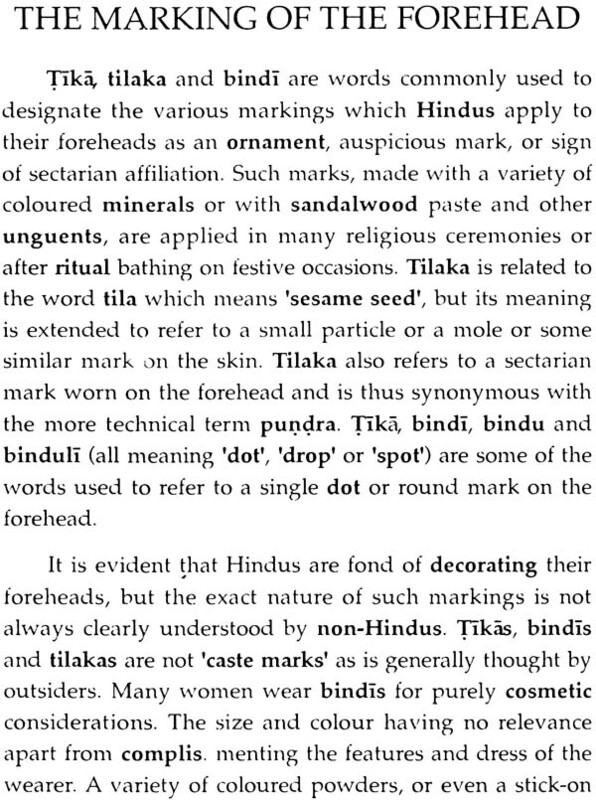 The origin and general practice of marking the forehead are discussed in an introductory section with a view to defining the sectarian tilaka in relation to other kinds of forehead mark applied by Hindus. 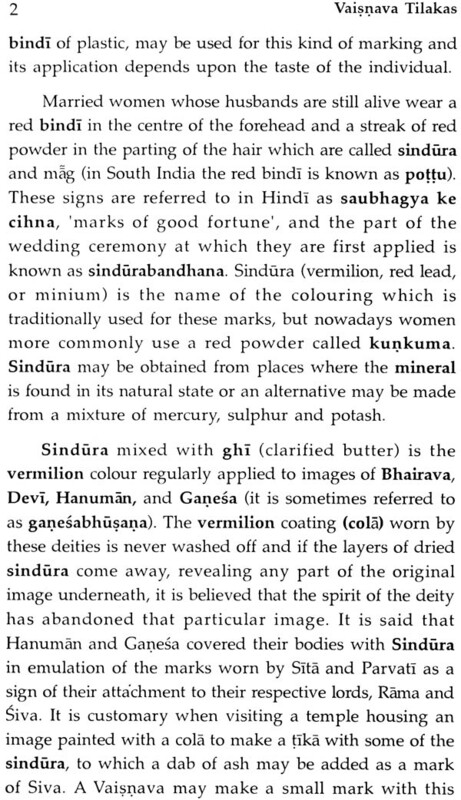 This is followed by a brief account of the tilakas worn by devotees of Siva and the practice of smearing the body with sacred ashes, which has been included in order to indicate the fundamental distinction between the way Saivas and Vaisnavas mark their bodies. 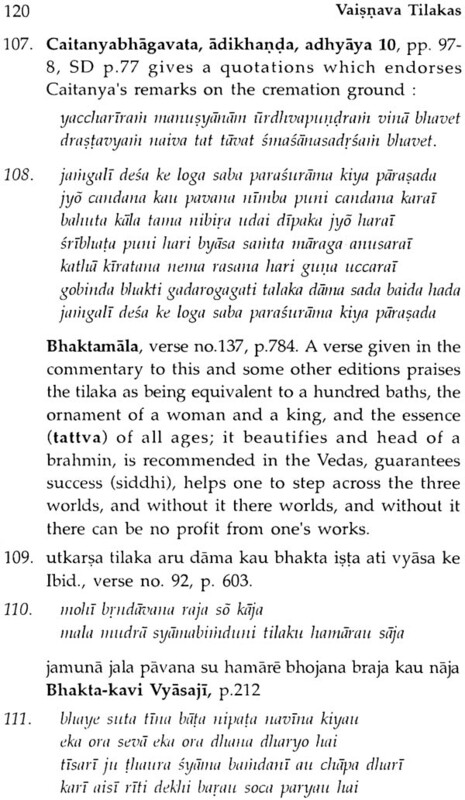 The third section deals with the scriptural authorities referred to by Vaisnavas for the explanation of the tilaka and the rituals involved in its application. 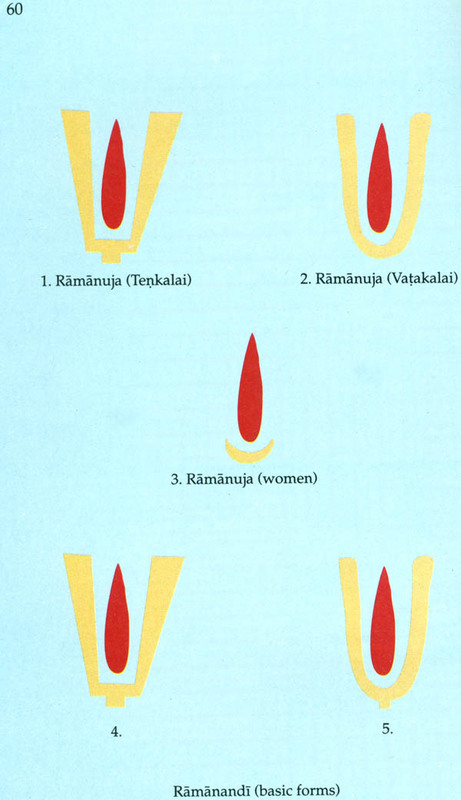 The fourth section deals with the different materials which are used for the markings. 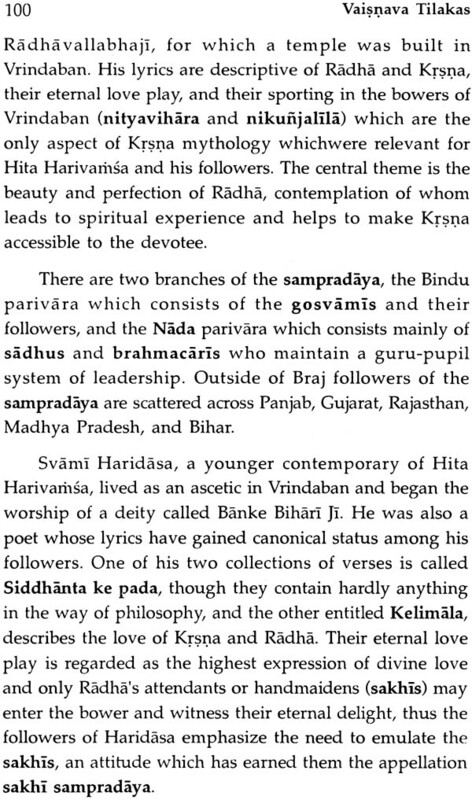 In both of these sections references are made to various sectarian manuals which deal with the rites and practices with an orthodox Vaisnava should observe. 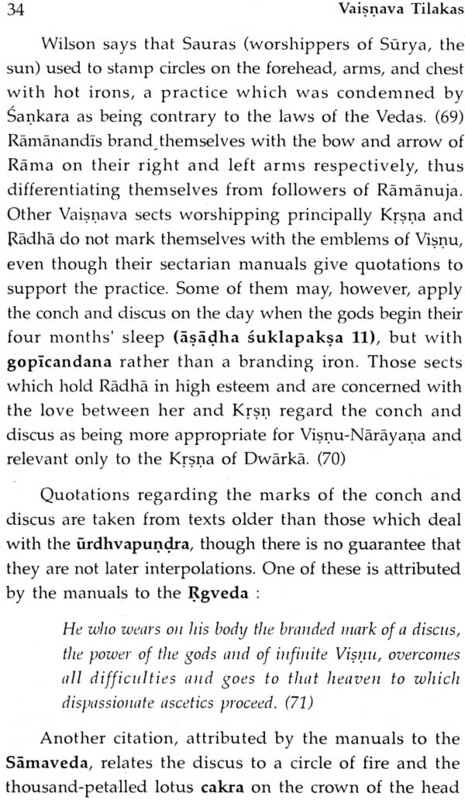 Such texts contain passages dealing with the significance of the tilaka, its method of application, and the merits of wearing it, with continual authorities have been taken directly from the sectarian manuals, not only because they are the sources referred to by the devotees themselves but also because many of their quotations are not to be found in published editions of the sctiptures and quotations from them in sectarian manuals are largely insignificant; some of the variant readings found in a published edition of the Padmapurana have been given in the notes in order to indicate the degree to which the two sources may differ. 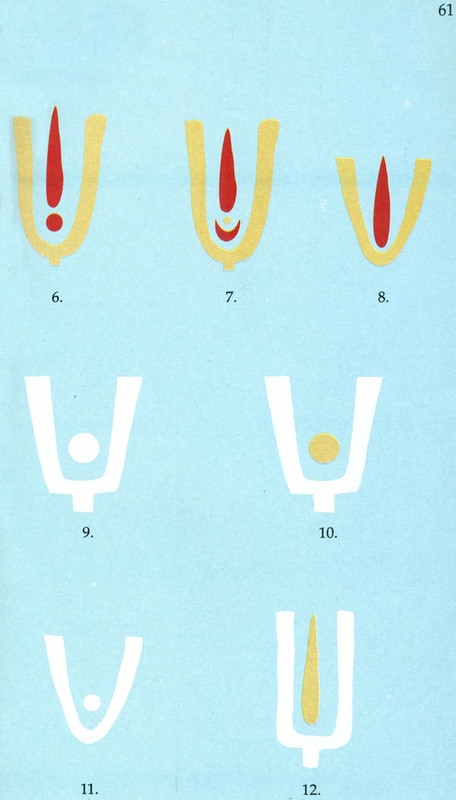 In the third and fourth sections the divergences observed in practice from the regulations laid down by the sectarian manuals have been indicated. 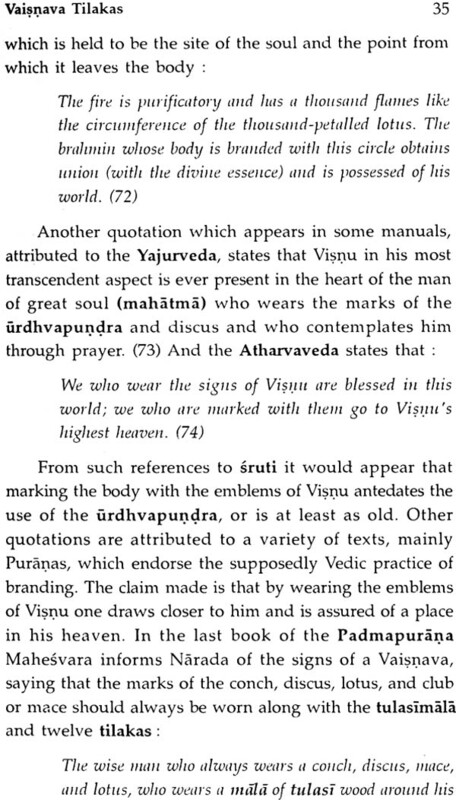 The wearing of the tulasimala and the practice of branding or marking the body with emblems of Visnu have also been discussed in the third section since they appear in the manuals in the same context as the tilaka and are also regarded by Vaisnavas as a sign of their faith. 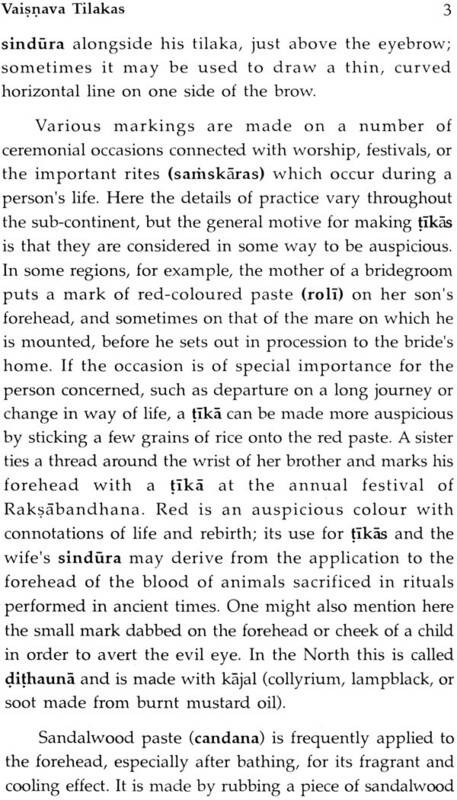 The fifth section illustrates the varieties of tilaka current among the sects and sub-sects with descriptions of the manner in which they are drawn. 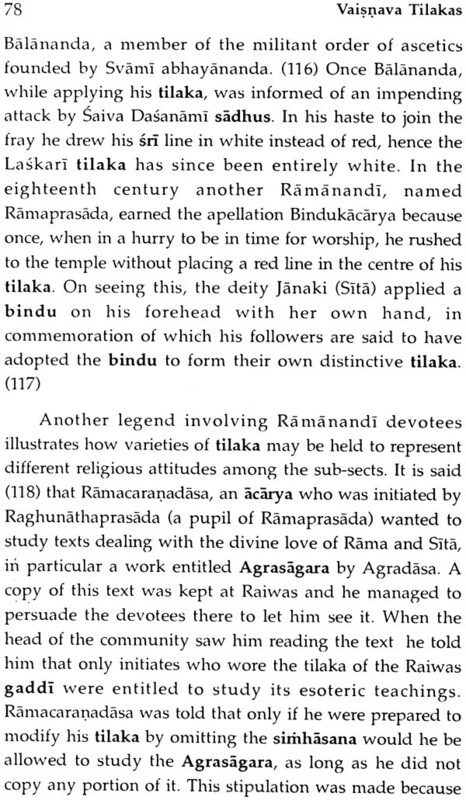 The final section presents a few legends told about Vaisnava saints in order to illustrate the significance the tilaka has acquired as a symbol of faith. 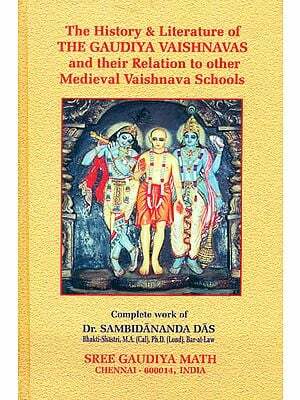 For the benefit of readers who are not acquainted with the Vaisnava sects a brief survey of their history and characteristic features has been given as an appendix. 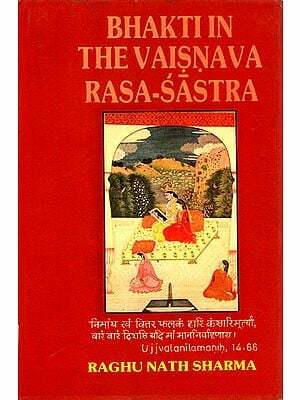 Besides acknowledging the International Association of the Vrindavan Research Institute for its financial support, and Professor J.C. Wright and Dr. R.D. Gupta for their advice and encouragement, I must also express my thanks to all members of staff of the Vrindavan Research Institute who were so helpful during the course of my field work. Among them I must thank in particular Dr. R.S. Jaitly, Dr. M. L. Gupta, Shri Gopal Chandra Ghosh and Shri Brindaban Behari for their assistance in locating and interpreting several of the texts cited. Among the many informants who have given helpful suggestions I am especially grateful to Mr. R. C. Sharma (Director, Government Museum, Mathura), Shri Braj Vallabh Sharan Shastri, and Acharya Gaur Krishna Sharan.